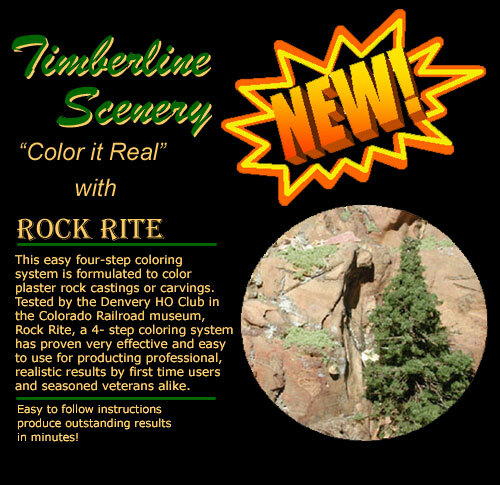 "TAKES THE GUESSWORK OUT OF COLORING SCENERY!" Rock Rite is a new water based, four part coloring system that is especially formulated to give plaster or foam a realistic look without a lot of mixing and guesswork. Rock Rite is available in both 8 oz. and 16 oz. bottles and four colors, Taos Tan, a light tan color; Sonora Sand, a reddish hue; and Phantom Canyon, a dark brown color, and Shade 'n Shadow, a black wash that adds depth to cracks and flat spots that might be under shadows. Each color maybe used by it self or blended together with the others. All four colors may be purchased separately or in a kit for extra savings.